Anyone with a grade school child will at some point be asked whether they'd like to be a room parent for the classroom, which is one of the parents who coordinate the classroom parties throughout the school year. Most classes have four to five parties per year including Halloween, Winter (or Christmas) party, Valentine's Day, Spring (or Easter) party, and end-of-year. The dates and occasions of the parties for your classroom. How much time will be allocated to each party? Does the teacher want the parents to run the entire party, or will she be organizing some of the activities? Does the teacher expect a craft at every party? Does the teacher expect the room parents to organize a game at each party? Will there be goody bags at the parties? Will funds be collected for the parties from all of the students, and who is responsible for collecting the money? If not, is there a budget for the parties, or are the room parents responsible for organizing donations for things such as food, crafts, party goods, and goody bags? What kind of food does the teacher want to be served? After the ground rules have been established by the teacher for the parties, it's time for the room parents to decide how they will divide the responsibilities for each one. Usually, the teacher will request that one parent is the point person for contacting her about the parties. After that, the group may decide to meet before each party to divide the duties, or they may have only one meeting at which it's determined who will be responsible for crafts for all parties, who is responsible for food for all parties, who will contact the other class parents for donations, etc. When planning snacks for a class party, the first thing we like to know is whether there are any allergies in the classroom. You'd hate to have a parent send in peanut butter cookies if there's a child with a nut allergy! It's always good to have some kind of healthy snack such as a tray of cut fruit. Don't go overboard on the healthy snacks unless that's the only thing you're serving. Given a choice between cookies and veggies, which do you think kids will pick? Baby carrots and sometimes sliced cucumbers are popular snacks for young kids, especially when served with ranch dip. Try to plan snacks that carry out the theme of your holiday. For example, creepy spider cupcakes for Halloween; Valentine's cookies for Valentine's Day; marshmallow chicks and bunnies for a springtime party, etc. Food is usually the easiest donation to get from parents. Every class seems to have one mom who enjoys making seasonal cupcakes or cookies. Salty snacks are also popular party food. Potato chips usually win out over pretzels in my children's parties. Don't serve too many choices. Otherwise, children will load up their plates, and then you'll see a ton of food dumped into the trash can at the end of the party. In most cases, especially for the younger grades, it's helpful to have all of the supplies organized prior to the party. That means having all of the pieces pre-cut and creating a bag of craft components for each child. This is not so much for the benefit of the child as it is for the benefit of the room parents! Otherwise, you will find yourself running around during the party as you divide the supplies and making sure that everyone has what they need. Cutting skills are variable at all ages, and if you give the children too many things to cut, their completion times will vary wildly. Paint miniature pumpkins for Halloween. Make spiders using black pipe cleaners at Halloween. Fashion ghosts out of lollipops covered with squares of white fabric tied on the stick and decorated. Create snowmen out of styrofoam balls, pom-poms, and buttons for winter parties. Make gingerbread houses at a winter party. Give each child a small, empty, clean milk or juice carton. Let them cover the carton with graham crackers using white frosting as "glue". Finally, give them a selection of colorful candy to decorate their house using the frosting. Make hearts with pipe cleaners and beads for Valentine's Day gifts for a loved one. 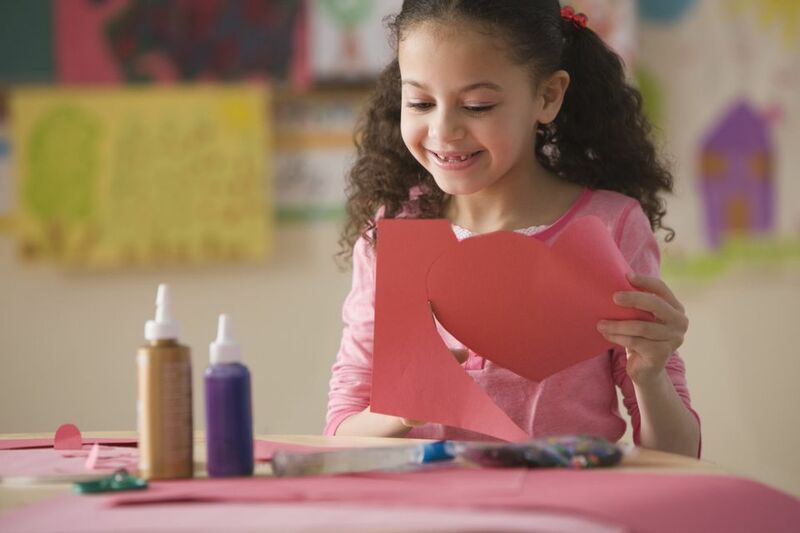 Decorate large cut-out hearts at Valentine's Day. Paint and plant small flower pots for a springtime party. Create tissue paper flowers for a springtime party. Create marble art by placing a sheet of paper in a shallow box, dipping marbles into different color paints, and roll around in the box for a colorful design. Relay races using plastic eggs and spoons. Water balloon toss (outside only). Freeze dance - an ever-popular classroom activity where you play music, the children dance, then suddenly stop the music and the children freeze. If they're caught moving when the music is off, they're out. Continue to play until one dance is left. A variation on musical chairs where hula hoops are placed on the ground and the children parade around the hoops and jump into one when the music stops. Works well in the gym or outside. Duck, Duck, Goose - The children sit in a circle, one child goes around and gently taps each child on the head saying duck, until she decides to make one the goose. The child tapped as goose needs to chase the child around the circle. If the child gets back to the open spot without being caught, the new child becomes "it". Turn it into a dance party where the kids play musical games. Pass the potato or pumpkin, valentine, or any theme appropriate object. Play until one person is left in the circle. Mummy Wrap - A fun game for Halloween. Divide children into groups and give each group a roll of toilet paper. Then the race is on to see who can wrap a member of their group with the complete roll of toilet paper first. No face wrapping is allowed!